MARINE CORPS BASE HAWAII, KANEOHE BAY, Hawaii — The final flight carrying the Marines and Sailors of 3rd Battalion, 3rd Marines touched down on Marine Corps Base Hawaii, Kaneohe Bay, late Tuesday night, signaling an end to their eight-month deployment to Afghanistan where they were deployed in support of Operation Enduring Freedom. As the “tip of the spear” operating in the still-embattled border provinces of eastern Afghanistan, America’s Battalion fought to deny sanctuary to Al Queda-affiliated movements while working with the Afghan National Army and police to increase the effectiveness of the Government of Afghanistan’s organic forces. They also worked to improve the overall stability and security of the country. America’s Battalion Marines said the Afghanistan they left behind was a noticeably different place, staged and ready for the upcoming national parliamentary elections which, in many eyes, will solidify the legitimacy of Afghanistan’s first democratically-elected government. “Our legacy is a significantly changed security environment in places that were once far more volatile; places like the Peche District in Kunar; the Alishang and Alingar Districts of Laghman and the southern districts along the Tora Bora mountains in Nangarhar,” said Lt. Col. Norm Cooling, America’s Battalion’s battalion commander. Cooling said that America’s Battalion’s sister battalion, 2/3, will face many of the same challenges his Marines and Sailors faced as they strive to maintain an environment that may ultimately make members of the 3rd Marine Regiment some of the last Marines needed on the Afghan front of the Global War on Terror. As Marines continue to fight terrorist movements throughout the Middle East, Afghanistan still poses a particular challenge. The geographic features include wide desert expansions as well as some of the most rugged, perennially snow-covered mountains in the world. The temperature and environmental extremes that Marines were faced with while coping with that rough terrain were compounded by having to fight experienced fighters in their own backyard. 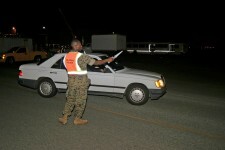 Nevertheless, Marines have performed there duty there faithfully and effectively said Cooling. “We are the premiere force in this environment. It is in our blood and dates back to the times when our predecessors were writing the Small Wars Manual. We are willing to go into difficult and uncomfortable places for indefinite periods to effect a change in the security environment,” he said. As the families of America’s Battalion begin to transition back to a non-deployed lifestyle, Cooling also said they will face their own, non-combat related challenges. Five children in matching orange tops and white shorts rushed to hug their father, Capt. K.C. Barr, as he stepped off the plane. They presented him with hugs, kisses and a handmade Father’s Day card.”We have presents and cake waiting for him at home, but he doesn’t know that,” Barr’s 9-year-old daughter, Alexis, said with a big smile and tears of happiness streaming down her face. 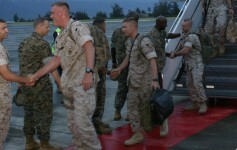 Barr is one of nearly 300 Marines returning to Hawaii after spending 7 1/2 months in Afghanistan’s central and eastern regions, participating in stabilization, security and counterterrorism operations. “He missed all of our birthdays and Father’s Day, but he made it home in time for his birthday, our 11th wedding anniversary and the birth of our daughter,” Michelle Barr said as she patted her stomach affectionately. “Hope is due in six weeks,” she said. 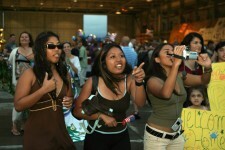 When the plane carrying the remaining members of Kaneohe’s 3rd Battalion, 3rd Marine Regiment, touched down a little after 7 p.m. yesterday at Marine Corps Base Hawaii at Kaneohe, a band struck up a tune while nearly 200 family members and friends cheered and waved signs. 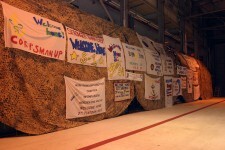 Yesterday’s group was the largest among 1,000 Marines who left for Afghanistan in November. The first four groups have returned in waves since Thursday. Two men were killed in action, and 12 more were wounded.While stationed in Afghanistan, the battalion was responsible for an area about the size of West Virginia.”Prior to our arrival there was no sustained U.S. presence, and four al-Qaida-related groups occupied the area,” Cooling said. The unit, called “America’s Battalion,” fought insurgents, patrolled the area and offered humanitarian aid to civilians. They were replaced by about 900 Marines in Kaneohe’s 2nd Battalion, 3rd Marine Regiment. KANE’OHE — Two-year-old Elijah Salarzon cried every day after his father left for Afghanistan last November. Last night, Daddy returned the favor. Sgt. Theodore Salarzon was one of about 200 Marines and sailors with the 3rd Battalion, 3rd Marine Regiment based at Kane’ohe who returned to Hawai’i after an eight-month deployment to Afghanistan. Another 800 members of “America’s Battalion” will be returning to the Islands today, Sunday and Monday. 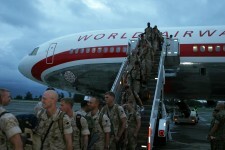 The Marines left Afghanistan on Tuesday, beginning a long journey home that saw them set down in Turkey, Ireland, Maine and San Francisco before the final leg to Hawai’i. A gathering of family, friends and fellow Marines let out a loud cheer as the chartered ATA Airlines aircraft touched down at the base at 6:30 last night. While on deployment, Salarzon said his thoughts were always of his family. “Every day, I thought about my family, will I be able to see my family again,” he said. Last night, his wish was granted as he fell into the arms of his wife, Mary Ann, and son Elijah. Mary Ann Salarzon said it was difficult at first to adjust to her husband being gone. She said it was particularly tough because he was gone during the holiday season. Sgt. Dennis Gilbert was greeted by his wife, Marieta, and their 2-year-old twins, Amber and Dennis Jr. 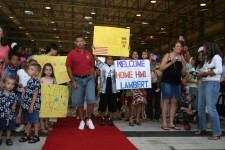 While he was gone, the Gilberts bought a home in Mililani that Sgt. Gilbert would see for the first time last night. Gilbert, 27, spent several minutes soon after he landed hugging and kissing his two children. “I missed these guys growing up. That was the worst part,” Gilbert said. Staff Sgt. Gatai Patu said his return last night was a “glorious occasion.” The 35-year-old Farrington High School graduate and Wai’anae resident was greeted by his mother; wife, Gilda; and sons Uelese, 3, and Nafoa, 1. Patu said he enjoyed his time in Afghanistan and said the country reminded him of Hawai’i. He said he and his men came under some insurgent fire, but for the most part were treated well by the Afghan people. “The people of Afghanistan are just like the people of Hawai’i. They’re very friendly, they’re very generous. They invited you into their homes,” Patu said. “It reminded me of the Bible stories with goat herders, the mud houses,” Patu said. The 3rd Battalion, 3rd Regiment Marines did suffer two casualties, however, when Lance Cpl. Nicholas Kirven, 21, of Richmond, Va., and Cpl. Richard Schoener, 22, were killed in a May 8 ambush. Their platoons were involved in a firefight with insurgents who were holed up in a cave. Kirven and Schoener were the first into the cave and were killed by small-arms fire. The 1,000 Marines that are returning include members of the 1st Battalion, 12th Marine Regiment; Combat Service Support Group-3; and Combat Assault Company. 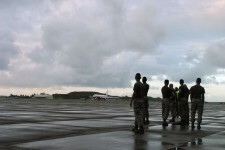 They replaced the 3rd Battalion, 6th Marine Regiment out of Camp Lejeune, N.C., and were replaced by the 2nd Battalion, 3rd Marine Regiment from Kane’ohe.